Fáilte go dtí an blag múinteoireachta Éireannach nua seo. Tá mé ag súil go mbeadh an blag seo úsáideach d’aon múinteoir ar bith, ach go háirithe go gcuirfidh sé smaointe, spreagadh agus acmhainní ar fáil d’éinne atá ag múineadh sna céadta Gaelscoileanna timpeall na tíre seo. Uaireanta, bíonn sé fíor-dheacair teacht ar acmhainní ranga atá i nGaeilge ach ba bhreá liom sin a fheiceáil ag athrú. D’oscail mé siopa ar TpT agus de réir a chéile cuirfidh mé réimse leathan acmhainní ar fáil. Tabhair cuairt ar an siopa anseo. Tháinig mé déanach ag an múinteoireacht, i ndiadh roinnt blianta a chaitheamh ag obair san earnáil neamhbhrábúis. Go dtí seo tá mé théis dhá bhliain a chaitheamh leis na naíonáin bheaga agus tá me faoi láthair ag druidim go deireadh na bliana le Rang 6. Tá mé ag súil go mór le mo thaithí agus mo chuid smaointe a roinnt libh uilig. Le bhur dtoil, sínigí suas chun an blag seo a leanúint agus aimsigí ar Facebook agus ar Pinterest mé chomh maith. Welcome to this new Irish teaching blog. I hope that it will be useful to any teacher at all, but especially that it will provide ideas, inspiration and resources to anyone who is teaching in the hundreds of Gaelscoileanna around the country. 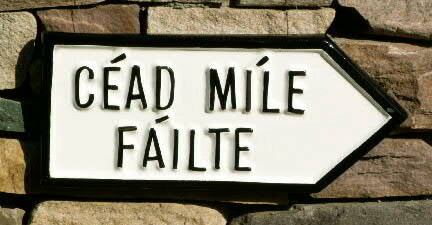 Sometimes, it can be very difficult to find teaching resources in Irish and I would love to see that changing. I’ve opened a TpT store (TeachersPayTeachers) and over time I will provide a wide range of resources there. You can visit that store here. I came late to teaching, after spending a number of years working in the non-profit sector. So far, I’ve spent two years with Junior Infants and I am currently nearing the end of a year with Rang 6. I am very much looking forward to sharing my experience and my ideas with you all. Please, subscribe to this blog and be sure to find me on Facebook and on Pinterest too.